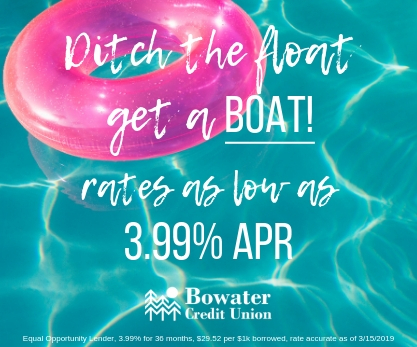 Ditch the float & get a BOAT! This is the year to ditch the floats and get the boat you have always wanted! You can choose fixed-rate financing for 36 or 60 months and pay no money down. Or, you may elect to take avantage of our 72-month variable-rate loan if your boat is valued at $10,000 or more. 120-month variable is avaliable on boats valued over $30,000. Finance with a fixed rate for up to 100 percent of the NADA Average Retail price. If it is valued over $3,500, you can take advantage of our 60-month variable-rate program. 120-month variable is avaliable on boats valued of $30,000. TShirt Design Contest: Winning Member Gets $100! 2019 Pot O’ Gold Winner!